A while back my brother picked this box lid out of someone’s garbage and gave it to me. I thought it kind of nice and despite the condition thought it might be fun to frame it. Around the same time as Scalextric came out with their racing set another company called Victory Industrial Products produced their own set that was in some ways superior to that of Scalextric but due to better marketing VIP is no longer well known except to those that had the privilege of owning a VIP model raceway in their youth. A very small company that began it's life during the second world war to manufacture small electrical components for the Ministry of Supply. 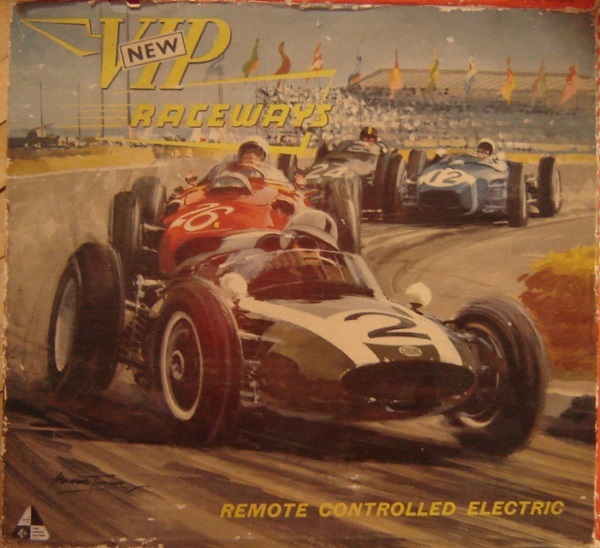 The new 1:32 VIP Raceways system first appeared at the London toy fair in February 1961. With stunning set-top artwork by the then relatively unknown artist Michael Turner, the new R1 sets were given a very warm reception by the trade press. The sets were available between 1961 and 1965. These sets generally included one R60 Cooper and one R61 Lotus but were also sold with two Coopers or two Lotus throughout their production life. My first track was a Marx set with a Jag and a Ferrari and it was ok. But there was a hobby shop down the street from the Chevy dealership my dad ran, and it had a VIP set in the window. It took a while to talk my parents into getting it for Christmas, I'd guess 1964, but I succeeded. It was a huge step up and I've been hooked on slot cars ever since. My set came with a great looking MG and Austin Healey and I later added the Lotus and Cooper, all with front end steering and good handling. I still have the cars and the track, which was all metal and painted except on both sides of the slot. The VIP cars were the hot car of choice in English slot car clubs for a couple of years, but as you said, never really caught on in the US. 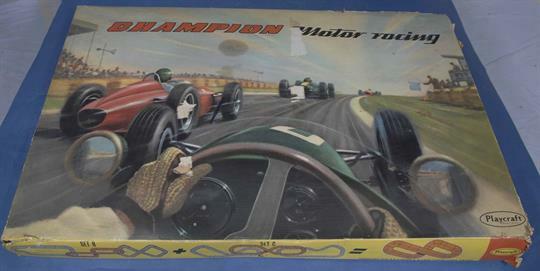 My set box didn't have the cool F-1 art work that you have, but I wish I had kept it anyway!